How do students live in Germany, and which subjects are the most popular? The Goethe Calendar 2017 provides answers to these and similar questions through attractive photos and exciting texts. You will find the accompanying teaching resources on the internet. The Goethe-Institut publishes a cultural photo calendar for schools and other education providers every year as part of its global education services. 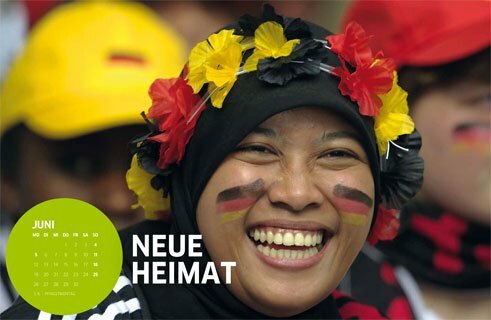 This year the focus is on People in Germany – young and old, Germans and non-Germans, with or without a disability. As well as the attractive pictures on the front, the reverse of each page features contemporary words that are motivational and diverse in character. The materials are designed for young German learners in Germany and abroad from the age of about 15, working at Level A1 to B1. Teacher’s notes and worksheets for use in the classroom are available online to download. You can also download the photos and texts from the website if you don’t have the calendar to hand. The materials are varied, allowing the students a differentiated view of people’s daily life in Germany. Each month takes a closer look at a different aspect of the main theme. Firstly the materials usefully complement the day-to-day cultural topics covered in textbooks, for example Living, Family or Work, by providing current information. Secondly themes that until now have not received much attention in textbooks, such as Inclusion or Actively Old, are under the spotlight. The large-format photos are not really images of regional culture in the classic sense – tourist attractions, landscapes or famous landmarks. Instead of teaching facts about Germany, the photos are intended to stimulate learners to talk by raising questions, irritating them or addressing unusual themes. The teacher can find various suggestions on how to use the pictures each month. These ideas can easily be applied to other images, creating variety and enhancing the lesson with minimum effort. Another advantage of the calendar is the diversity of the texts. They are current, adapted to the language level of the class and tend to be short, so that they work very well as supplementary material. Inclusion of a wide range of text styles, from interviews and statements to cartoons and blog posts, ensures authentic content that young learners find interesting and varied. It is also possible to use all photos and texts independently of the month and year. They are still available even after the year of publication. Whilst the focus for 2016 was Working worlds, the themes for other years have included Celebrations and Leisure. The teachers are given detailed instructions on ways to use individual photos and texts in the classroom. They come with copyable worksheet templates in which the teaching focus is on vocabulary and reading comprehension, as well as verbal and written expression. The lesson suggestions are skill-focused and hands-on in style. They also offer variants for digital media work. Each teacher hand-out starts with ideas for introducing the theme of the month, all of which involve that month’s calendar picture. Next the individual learning modules relating to those texts are described in small steps. The content of teacher hand-outs includes an overview of key phrases and suggestions for boardwork. Furthermore teachers can find cultural background information in the infp boxes. The method boxes explain key teaching methods. Speed-dating, also known as learning merry-go-round or double-circle, consists of verbal information exchange within a limited time on a specified theme. For the speed-dating activity, learners face each other in pairs. They are given a time limit within which to discuss a theme, and then one row moves down to the next person while their partners carry on speaking. Then the same row moves on to the next person again. The activity particularly encourages formulaic speech. To complement the teacher’s notes, the monthly interactive materials from the “Deutsch für Dich” community can be used. There you can find further resources such as audio texts with tasks and exercises. The key argument in favour of using the calendar in the classroom comes from the young people themselves. 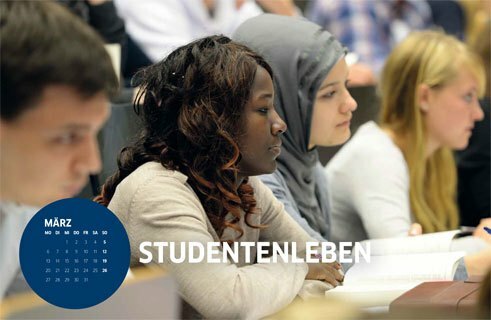 According to the study “Young people learn differently” (2014), three-quarters of students questioned would like to find out more about Germany in class. One of the things they want is to have “genuine texts from Germany” in lessons. So they would rather discuss texts that are authentic and current than work solely on passages in textbooks. The study also proves what a good idea it is to comply with the students’ request: their learning motivation for German as a subject increases in line with the proportion of culture-related content in the classroom. Christiane Bolte-Costabiei works as an educator in Germany and abroad, as well as an author and project team member for the Goethe-Institut, various publishers and other education providers. Anja Schümann is a freelance author, editor and educator in Germany and abroad. She works primarily for the Goethe-Institut and the Hueber-Verlag publishing house.